A physicist at The University of Toledo was awarded a $1.1 million grant from the U.S. Department of Energy to develop ultra-high efficiency solar cells that accelerate the conversion of the sun’s energy into electricity. 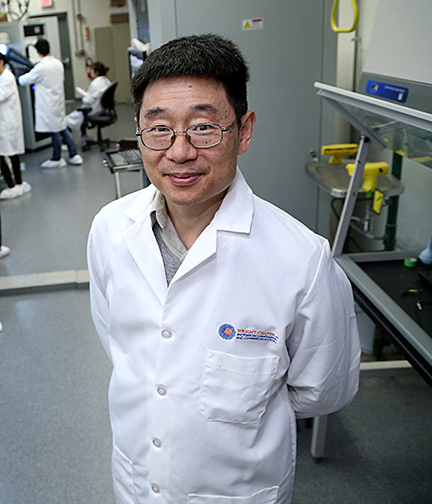 Dr. Yanfa Yan, professor of physics, is teaming up with the National Renewable Energy Laboratory on the photovoltaics project to create what are referred to as all-perovskite tandem solar cells that would have a higher conversion efficiency and lower cost. While the majority of solar panels based on polycrystalline absorber materials on the market today have about a 16 percent efficiency rating, Yan’s goal is to raise the bar by creating a cell with more than 25 percent efficiency. “We are excited about this opportunity and eager to collaborate with the National Renewable Energy Laboratory to push the performance of solar cells to a higher level and make contributions to the U.S. Department of Energy’s clean energy goal,” Yan said. Yan’s work is one of 25 projects recently awarded a total of $28 million in federal funding by the U.S. Department of Energy’s Solar Energy Technologies Office, which supports early-stage research and development to improve the affordability, reliability and performance of solar technologies on the grid. Yan is one of the leaders of UToledo’s area of excellence in solar energy, water quality and sustainable technologies. This entry was posted on Tuesday, April 9th, 2019 at 3:44 am and is filed under Natural Sciences and Mathematics, News, Research, UToday .